Or friend L. Brent Bozell III and his team at the Media Research Center (MRC) have released the findings of a new post-election poll on what actual voters thought about the media’s influence on the 2016 presidential race. The MRC/YouGov poll was conducted on November 9 and 10. “When you have a strong majority of actual voters saying the national ‘news’ media were biased in favor of Hillary Clinton and tried to influence the public to vote for her; and believing they are fundamentally dishonest, you have a major problem that can’t be fixed with an apology,” observed Bozell. “The public has rejected this institution as being either objective or truthful. There is an institutional bias at major media networks that must be repaired and I am highly skeptical that news executives are interested or capable of undertaking this responsibility,” he said. *7 in 10 (69%) voters do not believe the news media are honest and truthful. 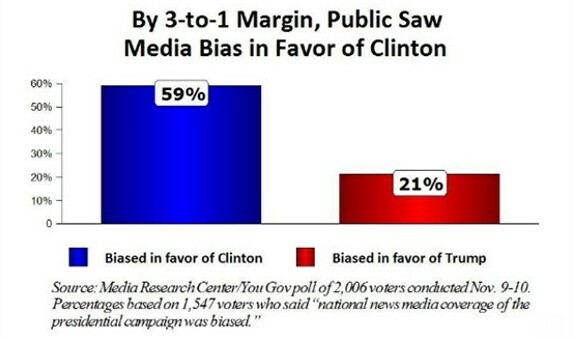 *8 in 10 (78%) of voters believe the news coverage of the presidential campaign was biased, with nearly a 3-to-1 majority believing the media were for Clinton (59%) vs. for Trump (21%). *8% of Trump voters said they would have voted for Clinton if they had believed what the media were saying about Trump. *97% of voters said they did not let the media’s bias influence their vote. “Despite the overwhelming and persistent bias of this cycle in particular, I am heartened by the fact that, according to our poll, the American people didn’t let it sway their vote. If this isn’t a wakeup call for the left-wing media to stay out of politics, I don’t know what is,” concluded MRC Chairman Bozell.